Fox & Co Plumbing & Heating specialise in restoring efficiency to your central heating systems with non toxic removal of sludge build up, improving your fuel bills and radiator efficiency. The cost of Magna Clean 'power flushing' starts from £300.00. 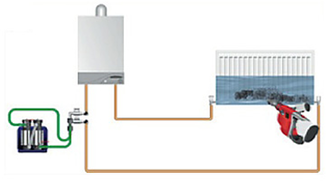 (Please note that this process will not remove blockages) depending on the type and size of system you own. Please click on the video below for a demonstration. For a no obligation estimate please contact or call us.